Heavy duty engineered polypropylene sump-pump for primery effluents / corrosive liquids and scrubbing systems. We are fully committed to providing the finest pumps, the best engineering, the most effective customer service & the greatest after sales support possible. The entire carbon filled teflon bush bearing which is located in the back place must be submerged in the pumping fluid at all times. 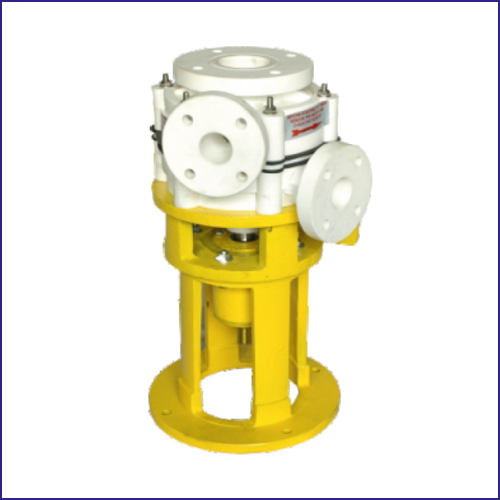 The robust, sturdy housing of our pump is made out of stainless steel, Hastalloy, Cast iron, Titanium etc. The selection of the material depends upon the liquid Characteristics. It plays a very important role in the overall performance & life of the pump It is made out of Natural rubber, Neoprine, Nitrile, Viton, PTFE, Hypalon. Normally hardened and chrom plated or stainless steel. Also rotors can be made out of Hastalloys, PTFE, Titanium depending upon the liquid to be handled. Its a very specially designed so as to offer increased service life with absolutely low replacement cost. Our SC- Series pumps are tested in a highly sophisticated testing arrangement to check the efficiency of each pump.